Sreenivas joined Watsi on June 5th, 2015. 10 other people also joined Watsi on that day! Sreenivas' most recent donation traveled 8,200 miles to support Bangirana, a man from Uganda, to fund hernia surgery. Sreenivas has funded healthcare for 14 patients in 8 countries. 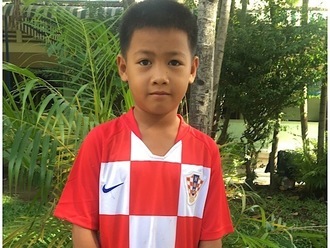 Va Youk is a second grader from Cambodia. He has two brothers. 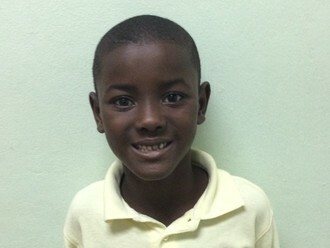 He likes studying mathematics and wants to be a nurse when he grows up. He loves to drink coca cola and read books. Seven years ago, Va Youk was burned by a pot of hot porridge, burning his left wrist. Burn scar contractures have developed, tightening the skin around his burn. It is difficult for him to bend his wrist and use his hand. When Va Youk learned about our medical partner, Children's Surgical Centre, he traveled for four and a half hours seeking treatment. On August 2, surgeons at CSC will perform a burn contracture release surgery to to use his hand freely again. Now, he needs help to fund this $448 procedure. His father says, "I hope my son's surgery is successful so that he can return to school soon." Yobe is a 78-year-old retired Malawian farmer. He lives with his wife and large extended family. He is too old to work in the fields, so now spends his days making mats to sell in the village. When he has downtime, he likes to chat with his village friends. Since April 2017, Yobe has been experiencing the troubling and painful symptoms associated with an enlarged prostate. He needs surgery, which will help him get back to a normal and healthy life. Yobe’s family were very upset that they cannot afford the operation necessary to treat Yobe. When the family arrived at Nkhoma Hospital, our medical partner's care center, they were relieved to hear about the Watsi program. Our medical partner, World Altering Medicine, is requesting $733 to fund Yobe’s prostate surgery. “I have no money to pay for my surgery. I thank you so much for the support,” says Yobe. Meet Nancy, a playful five-year-old girl from Kenya. Nancy has been in and out of the hospital for different medical issues. Her hearing loss is a congenital problem that her parents noticed when she was nine months old. She has never spoken, and her sound perception is quite low. On November 13, Nancy will receive hearing aids through our medical partner, African Mission Healthcare Foundation (AMHF). To help fund the hearing aids, AMHF is requesting $712 on top of the $52 contribution from Nancy's parents. Nancy's father says, “I want to see my child talk and hear. I will be happy to see her grow like a normal child." B. Zinash is a baby from Ethiopia who loves to laugh, play with water, and see new things. She was born with a congenital anomaly called bladder extrophy, which is a condition in which the bladder pokes through the abdominal wall. This condition causes B. Zinash pain and irritation. It also causes infection and leakage. As a result, B. Zinash needs special attention and care. Her parents are very worried and scared. They previously visited four hospitals, but they could not get the necessary treatment. Fortunately, they decided to visit our medical partner's care center, BethanyKids Myungsung Christian Medical Centre. There, B. Zinash will undergo a repair surgery on April 11. The family needs help to pay for this $1,500 procedure. 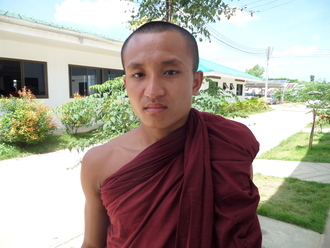 Kaw We is a 19-year-old Buddhist monk from a village in Burma. Kaw We currently lives and studies at the monastery in his village. His parents grow rice, and they pay rent for the land with half of their harvest. Kaw We is the youngest sibling in the family and has three older brothers and three older sisters. Kaw We has experienced uncomfortable urinary symptoms since he was a toddler. For most of his life, he relied on traditional medicine, which helped to alleviate the symptoms temporarily. Kaw We's family did not seek treatment at a hospital, assuming his condition was merely an annoyance and hoping to avoid the cost of modern medicine. With help from traditional medicine, Kaw We began to work on the family paddy field. Recently, however, Kaw We's symptoms worsened. He developed a fever, his face swelled, and he felt sharp pain in his abdomen. Traditional medicine no longer helped. Kaw We’s family learned from fellow villagers about our medical partner's clinic in Thailand. They decided to cross the border, traveling three hours to seek care for Kaw We’s condition. The family arrived on September 12, 2016. After several tests, Kaw We was diagnosed with a bladder stone. On October 31, 2016, doctors at our medical partner's hospital, Mae Sot General Hospital, performed a cystolithotomy surgery to remove the stone. Now, Kaw We's family needs help to pay for this life-changing procedure. “I would like to continue to be a monk," says Kaw We. "I am now more worried about my current condition, and my only hope is that it can be fully cured." "For two weeks now, Tabitha - a fruit seller - has not sold a single fruit. Having to bear with a lot of pain, Tabitha has had to take a hiatus," explains our medical partner, African Mission Healthcare Foundation (AMHF). "Tabitha, a divorced mother of five, has cancer of the right breast. Tabitha says she noticed a small painless lump in 2014. A year later, thousands spent, numerous tests done, Tabitha reports the lump has been rapidly increasing in size. The lump is also painful," AMHF continues. "Tabitha separated from her husband ten years ago. He provides little financial assistance and rarely communicates with the family. For ten years now, Tabitha has provided for her children and nurtured them: they have known her as both mother and father. Tabitha sells fruits in the central part of Kenya. From her earnings, Tabitha supports her mother who's diabetic and her last born daughter who is just out of high school." Tabitha needs a mastectomy to remove her breast, and ensure the cancer does not spread. Treatment will cost $740, but Tabitha has no way of affording the total cost. Fortunately, we can help make it happen. "We expect after a mastectomy, the risk of cancer spreading to other organs will be halted. Tabitha will be able to resume work and support her family," AMHF adds. Nyemo is a shy, twelve-month-old boy who lives in Tanzania with his mother and father. He is happiest when he is trying to walk around or playing with his wooden cars. Around nine months ago, Nyemo’s mother noticed swelling around her son's scrotum when she was giving him a bath. The swelling caused him such discomfort that he began crying. Since this incident, Nyemo has continued to experience swelling—accompanied by severe pain—periodically. According to our medical partner, African Mission Healthcare Foundation (AMHF), doctors have diagnosed Nyemo with a hernia, a protrusion of organs through the abdominal cavity that usually contains them. If left untreated, the hernia will progress, leading to intestinal obstruction. Hernia repair surgery can rid Nyemo of his pain. During the operation, Nyemo’s organs will be returned to their appropriate locations, and his abdominal cavity will be repaired. $610 in funding will cover all of the surgical expenses, along with medication, a three-day hospital stay and a one-week stay in a surgical rehabilitation center. Since Nyemo's parents work as small scale farmers, "their income is minimal and unstable," explains AMHF. Therefore, they cannot afford his treatment. “All we hope is for our son to get the right treatment and for him to continue with normal growth,” shares Nyemo’s mother.